This summer, as part of a collaborative study between the Ocean Tracking Network (OTN), Fisheries and Oceans Canada (DFO), and the University of Windsor, principal investigator Nigel Hussey and fellow researchers spent several weeks in the Canadian Arctic to continue ongoing tracking projects and fill knowledge gaps in the animal telemetry index. The data gathered on the team’s six-year study of Greenland halibut, Greenland sharks, Arctic skate and more recent work focused on narwhals will provide valuable information on the movement and distribution of deep sea fish (and of course a marine mammal) and help advise coastal community fishery development and management. 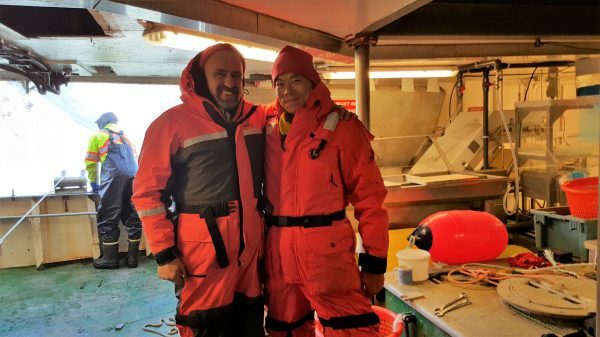 This season’s collaboration involved working with the DFO marine mammal team led by Jack Orr to continue the novel tracking of Greenland sharks. This tracking approach uses combined mark report and pop-up satellite tags to generate the first horizontal tracks for the largest Arctic deep water fish predator. Over the course of the season, the team successfully tagged ten individual sharks in Tremblay Sound near the community of Pond Inlet, where they set up basecamp for a three-week period, and all the tags have successfully transmitted to date. 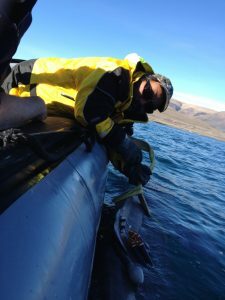 The collaborative team then achieved a first by attaching a Bluetooth-linked VMT (mini receivers that listen for tagged fish) to a SMRU satellite tag on a narwhal. 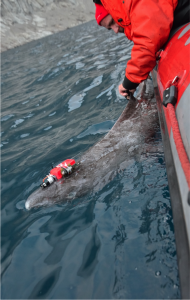 This will help them determine the viability of using narwhal as “animal oceanographers” or “bio-probes” to monitor sustainable fisheries across the Arctic. A team at Dalhousie University has already developed the bio-probe technology for use on grey seals. 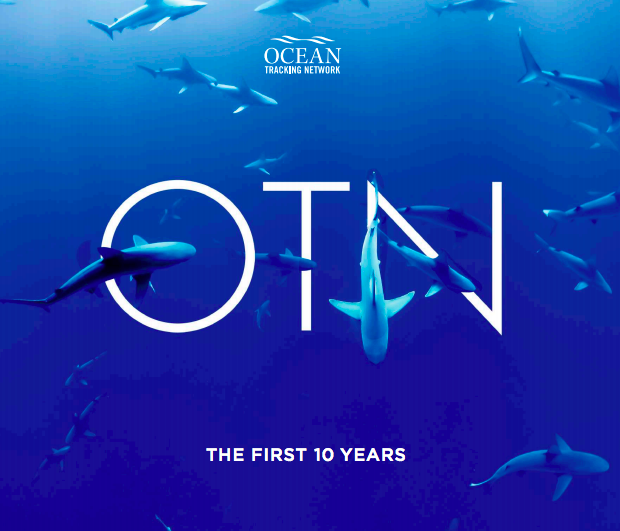 While marine autonomous vehicles (robo-probes) are also used in the collection of oceanographic and animal data, bio-probes will collect information where robo-probes can’t go, due to their limited range of movement and ability to navigate the oceans. In the second phase of the field season in Baffin Bay, high resolution daily diary loggers with cameras were attached to Greenland sharks to assist understanding of post-release survival from fisheries and to examine their ecology (predator-prey interactions are one example of this). The team were joined by expert Yuuki Watanabe from the National Institute of Polar Research in Japan to do this work. 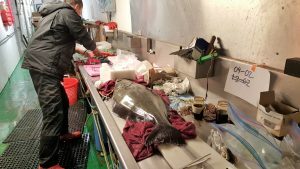 High-resolution accelerometers were also attached to Greenland halibut for bioenergetics works, while deep-water baited cameras were deployed in Scott Inlet to examine species diversity and undertake population assessments in conjunction with scientists from Memorial University. The team also worked closely with commercial fisheries in Baffin Bay, who have been incredibly open in sharing their data, allowing the team to gather valuable information to determine suitable locations for moorings that don’t compromise either fishing or research activities. A total of 43 new moorings were situated offshore in Baffin Bay, mainly along the shelf edge on the drop off to deep water and where most fishing is concentrated. The edge may serve as a “conveyor belt”, building predictable seasonal movements of Greenland halibut. 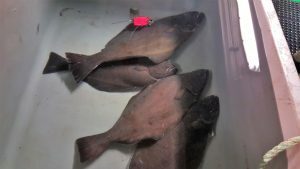 Around 200 Greenland halibut were acoustically tagged at various sites along the shelf edge for this study. Thus, the team had a very successful summer of Arctic research, and they look forward to sharing the results and footage with the science community and beyond. This work would only have been possible through the support of the local communities, the Government of Nunavut, CanNor, DFO and the crews of the Nuliajuk and Kiviuq. 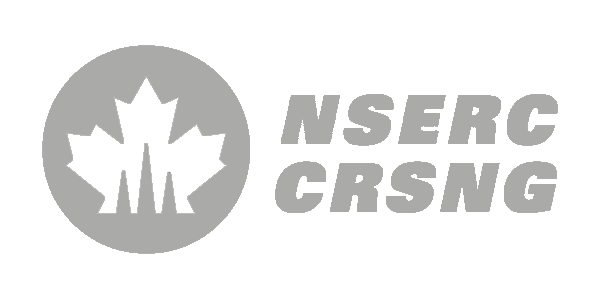 Nigel Hussey is an Assistant Professor in Biological Sciences at the University of Windsor. His research focuses on understanding the movements and trophic interactions of aquatic organisms and how these structure global food webs in the context of climate change.